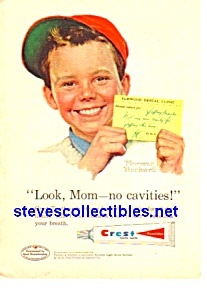 A great vintage full page original magazine ad for Crest Toothpaste. Ad measures approximately: 5 1/2" x 7 1/2". Image will fit a standard 5"x7" matte. (email if you'd like this piece matted in a quality white, acid-free matte for $6.00 additional) Condition: VG with some light yellowing of paper from age.